The village of Schiller Park is located approximately 17 miles northwest of the Chicago "Loop" in suburban Cook County. 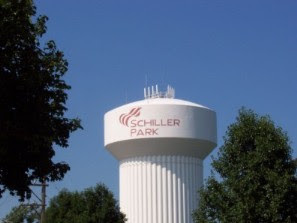 Schiller Park is bordered by the village of Rosemont to the north, the Cook County Forest Preserves to the east, Franklin Park to the south, and the O'Hare International Airport to the west. Transportation links include U.S. Route 19 Irving Park Road and U.S. Route 12/45 Manheim Road. The I-90 expressway passes on the northern edge and the I-294 Tri-State tollroad is on the western border of the village. Commuter train service to Chicago is available. According to data from the Northern Illinois MLS there were 34 sales of single family homes in 2007, down from 62 in 2006. The average sales price was $303,350.00, this was a decrease from $329,598.00 in 2006. Marketing times were an average of 116 days on the market, up from the 2006 average of 90 days. As of February 9, 2008 there are 52 active listings of single family detached homes in the MLS. At the 2007 level of absorption this is 18.37 months of unsold available inventory. A 3-4 months supply of inventory is considered "in balance", this level is an oversupply. To recap 2007 for detached homes, sales volume was down -45.16%, average sales prices were down -3.02%, and the days on the market were up +28.88%. This market is oversupplied and the 52 active listings have already been on the market an average of 176 days. The condo/townhouse market had 44 sales, down from the 94 properties that sold in 2006. Sales prices saw a decrease with the average 2007 sales price at $145,719.00, compared to $166,947.00 in 2006. Marketing times were an average of 141 days on the market, an increase from the 2006 average of 92 days. There are 77 active listings of attached homes in the MLS. Based on the 2007 level of absorption this is 21.03 months of unsold inventory. The condo/townhouse market is over supplied, sales volume was down -53.19%, average sales price decreased -12.71%, and the days on the market increased +53.19%. The 77 active MLS listings have already been on the market an average of 177 days.